Today I realized that, seriously, I need to make Christmas cards to mail out to my family and friends overseas before it gets too late. I've been busy making Valentine's Day cards for Operation Write Home. In order to get motivated, I made these 2 Christmas Cards for Challenges. 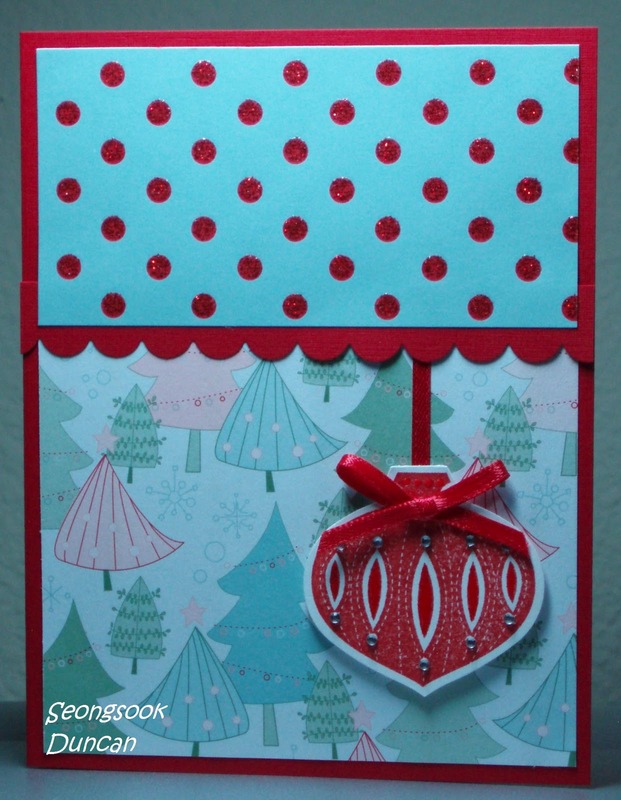 Challenge is to make a Christmas card using the colors red, green and white. Also use at least one stamp and one punch somewhere on your card.. I used Stampin' Up Ornament stamp, DSP, Scallop punch and Ornament punch. 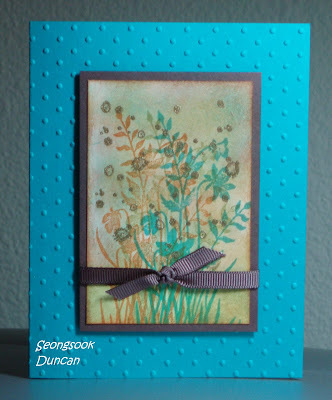 For this card, I used Stampin' Up DSP, Cuttlebug Embossing Folder, Digital Stamp from Spyder, 3D Paint and Copic markers. I love this cute image. Measurement: 6 panels of 4" x 4" square base, 6 pieces of 3.75" x 3.75" sqaure layering mat, 6 pieces of 3" circle, THANKS letters of 2" cut by Cricut machine, 3 Small flowers of 1" cut by Cricut machine. THANKS to everyone who supports me and encourages me and remembers me. Since I don't use any glittery stuff at all on my cards for OWH, I try to find the way to make it up. I am making as much as simple designs to work easier with my group of OWH cardmakers but very nice cards. 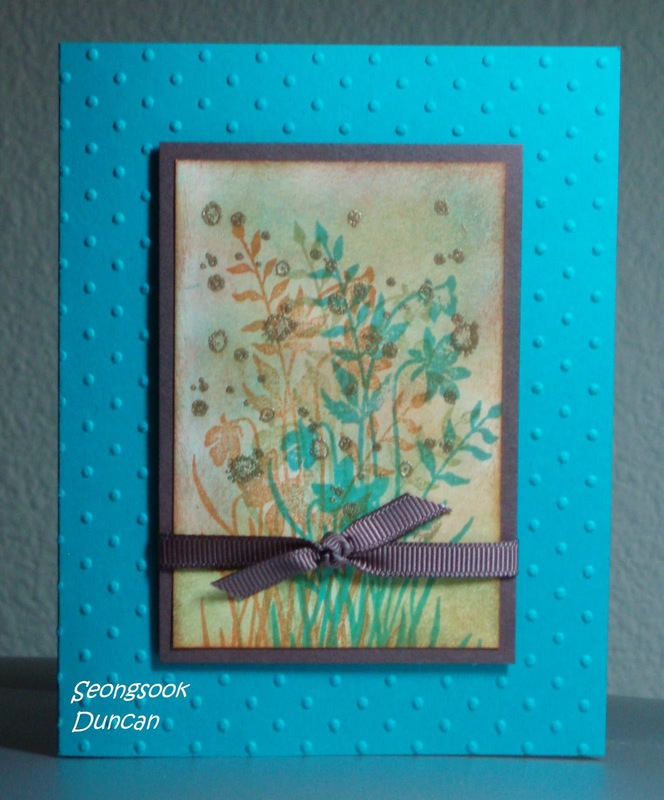 Frankly, sometimes I feel like I need to add something on my cards as I don't put many embellishments. 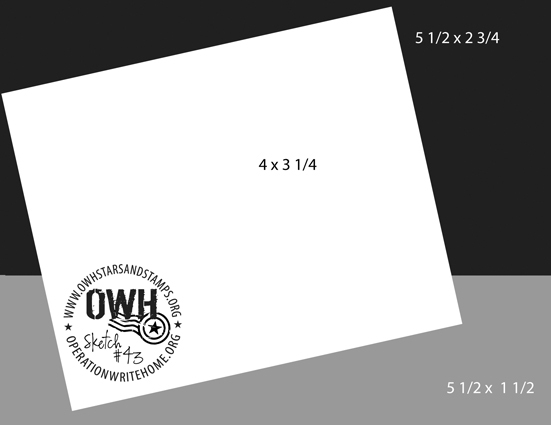 I am sticking with the OWH 'stay away from card hospital' guidelines. David is my card critic and he always says "know when to stop." whenever I ask him "don't you think I need to add something here?" Of course sometime he says "it looks plain... maybe it would be better if it is embossed." Here is a tip to glaze the flame of candles and dots on this birthday cake image. These Glaze pens are great tool. I hope you can see the glazed flame of candles and dots. 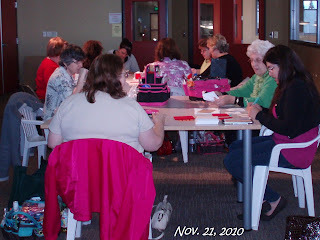 Thanks very much to Kathy, Mandy, Jordan, Caro Lou, Donna A., Janet Q., Carole, Beckie, Joan, Belinda, Maria and Amy for coming to OWH Cardmaking Party at Elk Grove Grocery Outlet today and made a lot of cards for our heroes and their families. What a fun gathering, too! Lots of laughter and hugs... wasn't that great! 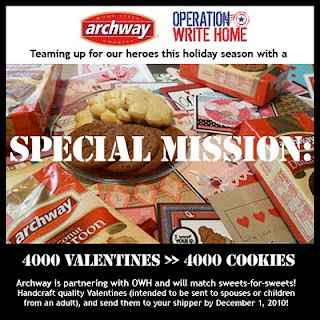 We made 130 Valentine's Day cards for OWH's Special Mission partnering with Archway Cookies. Including 24 Birthday cards and 4 Thinking of You cards, we made total 158 cards. Here are the pictures of cards to share. NOTE: This is Donna A. & Janet Q. 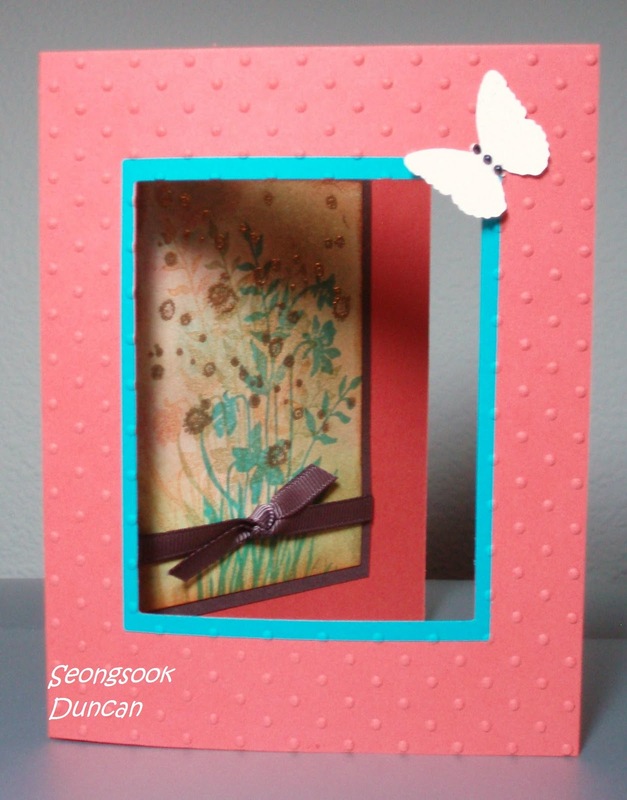 's first designed card. The heart with Cupid arrow was punched out by Jordan. Adding it to bigger sized hearts (white and red) that I cut with Cricut machine was Donna A. 's idea. It turned out perfect to make a focal point of Be my Valentine cards below. I do really thanks to ladies who made it for their great support, for their time to drive all the way to Elk Grove not only from Elk Grove or Sacramento but also from Lodi, Stockton, and Folsom, generous donations towards shipping cost and spreading words to others. Our next month OWH Cardmaking Party will be on Sunday, December 19th from 1 p.m. to 4 p.m. at Elk Grove Grocery Outlet Community Room. 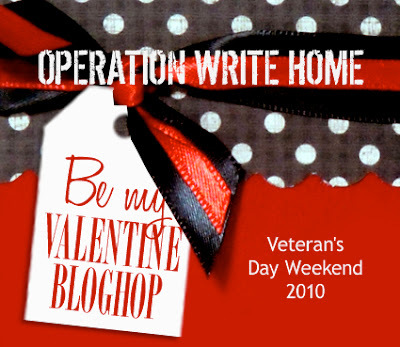 Wow... there are 134 commenters on my blog for the Operation Write Home Be My Valentine Bloghop - Veteran's Day weekend. Thanks very much for everyone's kind words for me and constant support for OWH. I had David to pick a number for my blog candy winner. The number he picked was 105. So the winner is ... Paula. 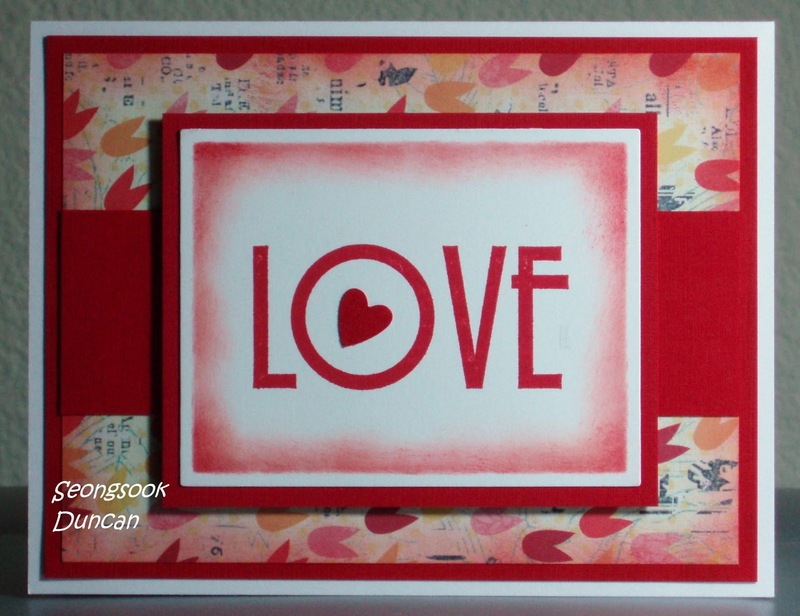 Love your cards!! Am so pleased to be getting such wonderful ideas. 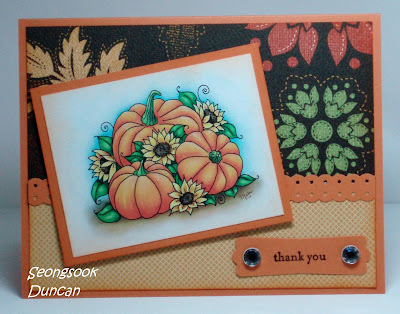 "Pumpkins & Sunflwers - colored" digital stamp is from Fred She Said. modern label punch are Stampin' Up products. ﻿NOTE: I started finding the challenge blogs and motivated by them although I was overwhelmed at the beginning. I want to say "thank you" personally to Karen Howard who has been listing all new challenge blogs updated on her blog: Feline Playful. 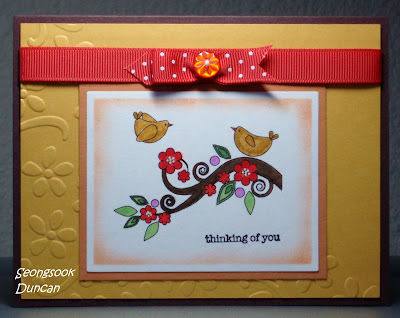 Not only you can find the challenge blogs that you can link back but also, more importantly, you can get great inspirations from other cardmaker's creations. I hope you will find something fun, too! I made this card to enter in Pink, Green & Brown Valentine's Challenge Cards for OWH at Simply Stamping. 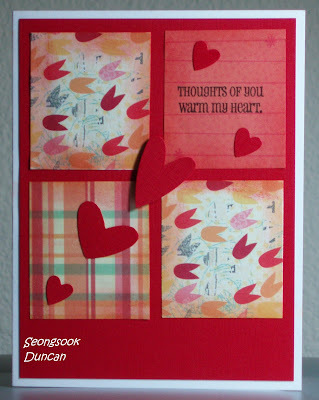 I used "floral heart" freebie digital stamp from AiFactory. 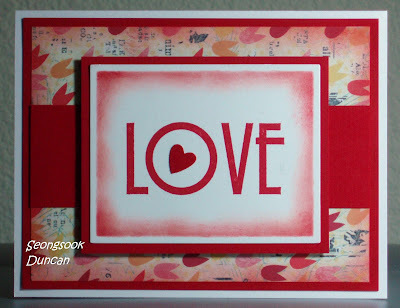 I embossed the background cardstock with a Stampin' Up embossing folder. 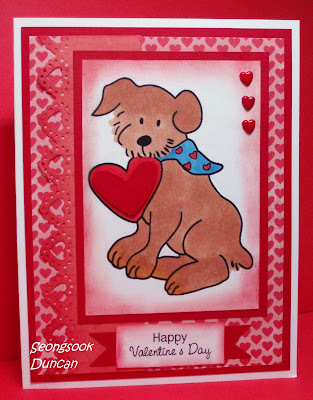 I made this card with a "Valetine Kolar" digital stamp set from ﻿Kathlyn at Splashes of Joy for her challenge at OWH BE MY VALENTINE Bloghop yesterday. Her challenge is to make a Valentine's day card with this image by adding at least 3 brads on the card. 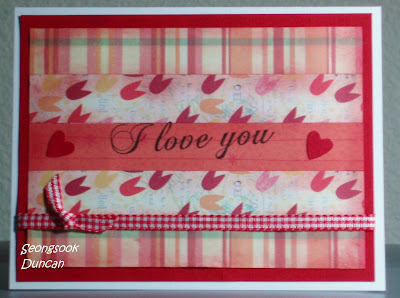 I colored the image with copic markers, sponged the edges, used MS heart border punch and added 3 heart shape brads. I added a heart punched out on the heart of the image to give a little bit of depth. Welcome to the Operation Write Home Be My Valentine Bloghop. I am happy to participate in this great event. 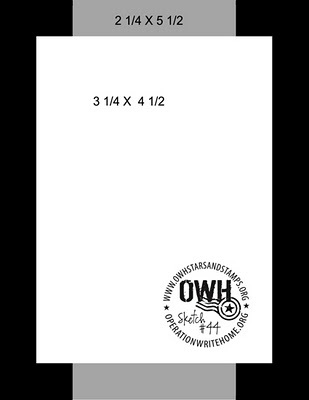 This Bloghop starts from Operation Write Home Stars and Stamp Blog. If you landed here from Sherrie's blog, you are in the right place. I am sure you liked her cute card with the spinner card mechanics. Operation Write Home's Mission is to support our nation’s armed forces by sending blank greeting cards to write home on, as well as cards of gratitude to encourage them. Please click HERE to learn how the project works. 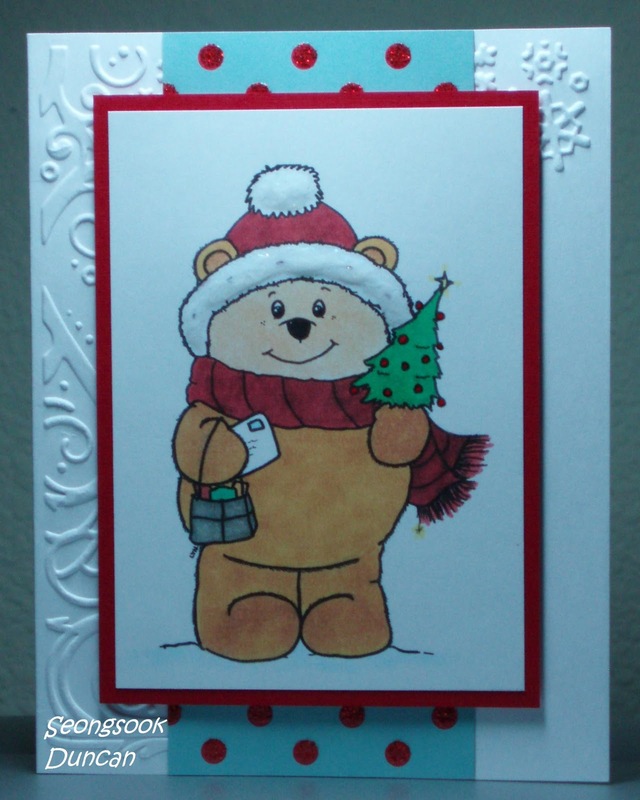 For your reminder, the deadline for CHRISTMAS CARDS has passed. 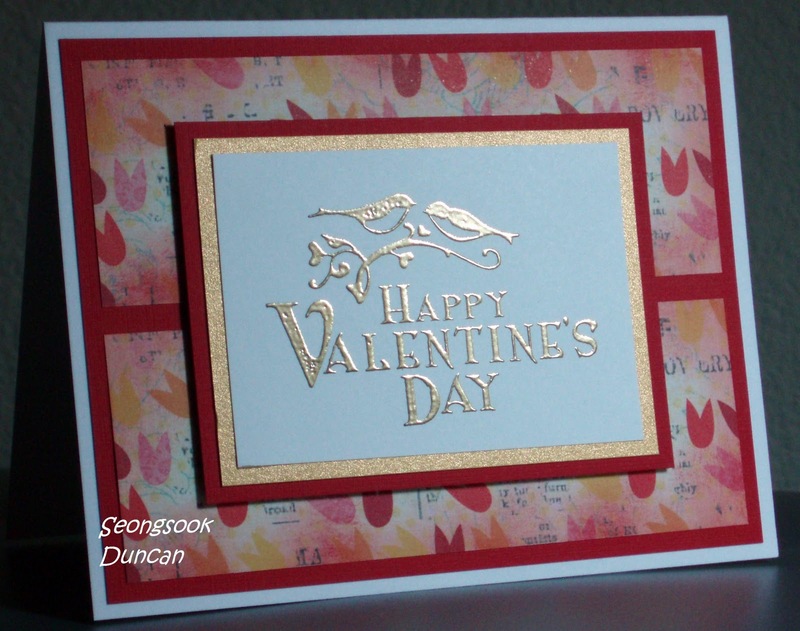 We are now making VALENTINE’S DAY cards that is due by JANUARY 7, 2011. 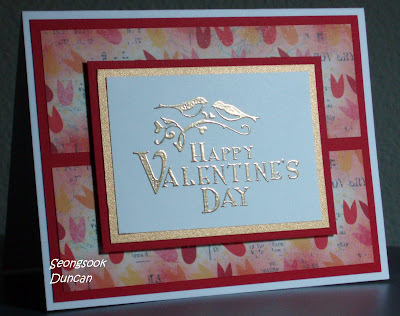 Here are some of my Valentine's Day cards that I want to share today and some tips for cutting a 12" x 12" patterned paper to make these cards with better usage. I used the OWH S&S Sketches as I added the link under each photo. 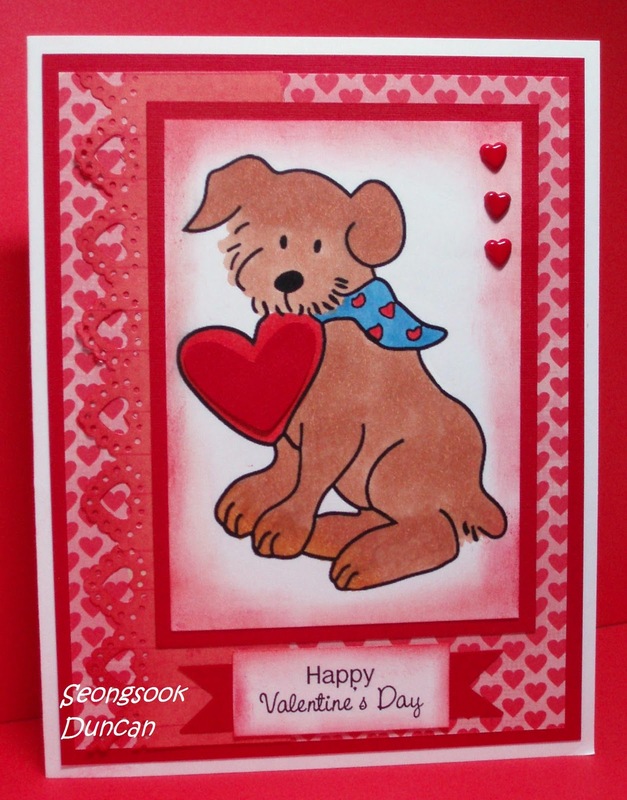 You can see the actual sketches and inspiring cards submitted by OWH cardmakers by clicking the link. This is my blog candy for those who leave comments and will follow the links below by clicking the picture. Please click the picture and you will find the details. Thank you for participating in Special Mission with Archway Cookies and Voting at JoAnn's Craft for a Cause. I will pick a winner on Friday, November 19, 2010 and announce next day. With this stamp set, I hope the winner will make some Valentine's Day cards for heroes and send them to OWH by January 7, 2011. Thanks for visiting my blog. Please continue along the bloghop by visiting the very talented Artist Designer Instructor, Rick at Rick St. Dennis MFA. 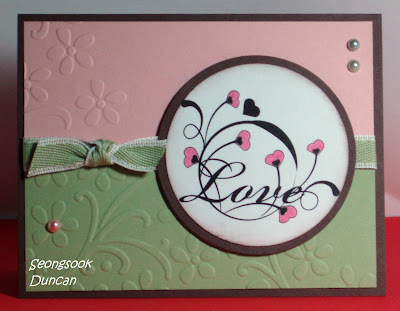 Cardstocks, embossing folder, button and ribbon are Stampin' Up products. Digital stamp is from AiFactory. I think this image would be also good for love, miss you, anniversary. I used Spellbinders Die Template. Colored with some of copics, SU watermarkers and white gel pen. Since I had an image ready in hand, it was quick. I made 13 of this card for the group of Pain Management Class. Today, we graduated from the 5 weeks of intensive pain management program. It was a great experience to see everyone's progress including myself. The real challenge is now to keep maintaining what we achieved. So I thought this sentiment is very appropriate for each one of us. I can do it!